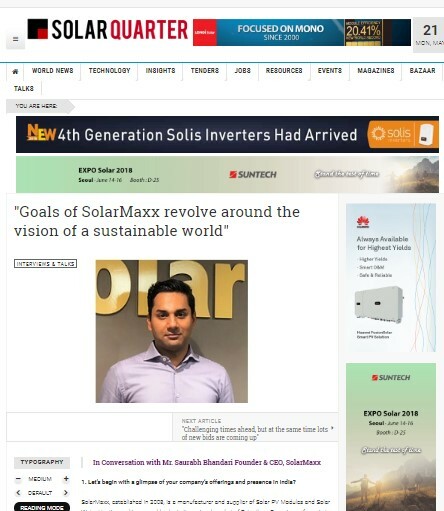 Solar Quarter in Conversation with Mr. Saurabh Bhandari, Founder & CEO of SolarMaxx, Illusions4real, Jaipur. 1. Let’s begin with a glimpse of your company’s offerings and presence in India? SolarMaxx, established in 2008, is a manufacturer and supplier of Solar PV Modules and Solar Water Heating and is a proud leader in its regional market of Rajasthan. Our primary focus is to produce quality product whether it is Solar PV or Solar Water Heating. Needless to say our products conform to global IEC standards and are proven to withstand the varied climatic condition of the Indian market that remains our primary focus market too. We also introduced Integrated Solar Street Lights that are completely made in India. These lights are equipped with latest Lithium Ion batteries and MPPT charging mechanism and have generated quite an interest in the domestic market. With increased focus on automation of our manufacturing processes, we have been able to offer our products promptly not only to cater the needs of the consumers in Rajasthan but we have also taken keen interest in spreading our wings in neighbouring states. Our EPC vertical has completed rooftop projects in Rajasthan, Haryana, Madhya Pradesh and Sikkim in the past few months. 2. Quality, Costs and Performance are key concerns for Indian consumers and EPC companies. How would you like to address these issues for your offerings in India? We are increasingly looking at automation in our production processes to avoid human intervention as much as possible in the entire production process. This has definitely led to increased “quality” output of modules. Not only is the wastage reduced but also the consistency has increased. This has obviously led to slight reduction with obvious improvement in product quality. We have always focused on efficiency and are increasingly production higher wattage modules that leads to overall reduction of cost at a project level. With use of high quality certified raw material, especially PID resistant cells, our performance is guaranteed for 25 years as per the industry norms. We believe price, performance and prompt delivery are our strengths. 3. What differentiates your company’s offerings from your peers? We focus on sourcing of extremely high quality raw material from some of the most renowned brands globally. We operate as a boutique production house with strong focus on quality. Our relatively smaller size helps us keep our cost overheads low without compromising on the quality of our product. With increased automation in production, we keep our product offering consistent which is very important for our clients that are mostly renowned EPC companies and developers. 4. You are an integrated company with verticals in module manufacturing as well as EPC for large utility scale and rooftop projects. Which of these areas do you find more attractive and why? 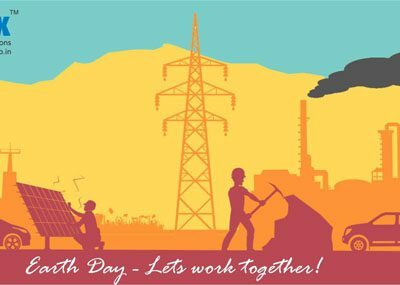 Solar sector has become extremely competitive in India due to the fact that it has attracted enormous attention from the Govt., investors, entrepreneurs and consumers. We are essentially a manufacturer and then an EPC services provider. Even though both the verticals operate independently, we do leverage synergies. It is difficult to pick out one out of the two as favourite as both require equal amount of focus. We use SolarMaxx modules in our EPC projects as we are confident of our own quality and performance. This also ensures that we continuously focus on improving our product output. Using our own manufactured modules in our projects gives us the comfort of offering long terms product warranties and generation guarantees. This acts as an added advantage to our clients as they receive maximum support at reasonable price point. 5. Can you talk about your plans to scale up your manufacturing capacity? Are your plans being influenced by the potential for safeguard and anti-dumping duties? Our plans are fairly independent of the currently discussed safeguard and anti dumping duties. India has a huge potential for Solar power both at smaller rooftop as well as large multi utility scale levels. Govt. plans to install 100GW of Solar Power by 2022 and with their focus on Make in India, we are bullish of this opportunity of scaling up as a solar panel manufacturer in India. We intend to double our production capacity this year and are also looking at setting up another manufacturing facility within India but at a different location to get closer to consumers. While we plan to increase our manufacturing base, we are also equally focused on expanding our services from playing the role of an EPC provider to becoming a project developer and an investor ourselves. 6. 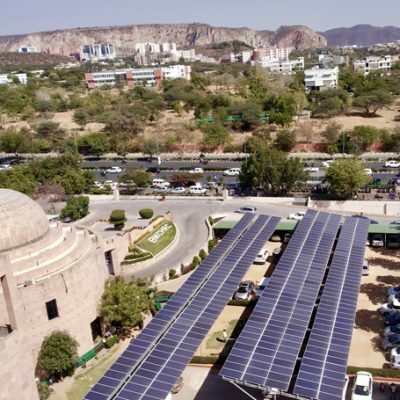 What are your thoughts of the future of rooftop solar in India? What are your plans there? Govt. of India has set a solar installation target of 100GW by the year 2022. 40GW out of this 100GW is planned for rooftops. I believe Rooftop Solar is an excellent solution for India’s power problems. Rooftop Solar in India is bound to grow at a high rate especially with increased awareness of the associated benefits. Businesses and institutions have understood the economics of Solar rooftop and have started to deploy solar panels on their factory sheds and office roofs. Subsidies have helped making rooftop solar attractive to residential users. It is to be seen how they may react once the subsidies are over, but the overall scenario looks exciting. There are some obvious challenges. DISCOMS are not particularly in favour of implementing or continuing net metering schemes as they directly affect their revenue. RESCO model especially in the private sector is still considered risky. As a module manufacturer, we are aggressively looking at supplying our modules to EPC companies for rooftop installations. At the same time we are actively looking at expanding our EPC business across India with a strong focus on rooftop installations. 7. As a module manufacturer, how do you ensure the quality checks? SolarMaxx Solar PV Modules are TUV certified from a globally recognized agency. Our modules have gone through a series of stringent tests to receive the necessary IEC certifications. For the satisfaction of Indian consumers, we have also got our modules tested at the MNRE approved test centre in India. Besides getting and renewing these certifications on a regular basis, we stringently control each stage of our manufacturing process to prevent production of a sub-standard or low quality module. Manufacturing of SolarMaxx solar PV modules is done in a dust free, air conditioned environment to avoid any foreign particle to enter the production cycle. Our raw material is sourced from reputed and globally renowned suppliers. Each of the raw material is IEC/UL certified from reputed agencies. Besides checking their certification, we test each and every raw material in house before taking them into the process. Our in house testing facility helps us segregate and thereby reject any defective or low quality input to ensure each module is of the optimum quality. Each module that we produce is visually, technically and electrically tested, plus sorted and packed. 8. You have been in the Indian market for nearly a decade. How did you conceive the idea of SolarMaxx? SolarMaxx was registered as a brand in 2008. 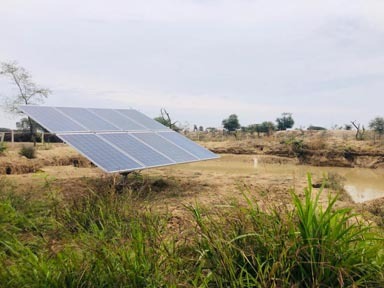 A small idea from a milk vendor led to the founding of this current solar venture, SolarMaxx. The goals of SolarMaxx revolve around the vision of a sustainable world. SolarMaxx indulged in import and distribution of Solar lamps for the rural India before diversifying into manufacturing of Solar PV Panels, Solar Water Heating and related Solar Energy equipment. 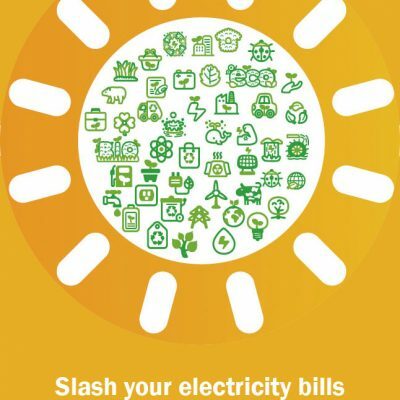 SolarMaxx played the role of a pioneer by taking Solar to the residential sector in 2008-09 when Solar was perceived as a very expensive and rather an experimental commodity. Having successfully launched residential Solar solutions in the early stages of SolarMaxx, we simultaneously introduced commercial and institutional solutions. By 2012-13, we were the leading Solar brand in Rajasthan with reasonable presence in neighbouring states. It was only in late 2014 that we decided to commence manufacturing of Solar PV Modules and set up our manufacturing facility in record time of less than 6 months. Today, as stated earlier, SolarMaxx solar modules are amongst the most popular modules in our regional market with all required certifications and approvals. Our EPC vertical has completed several small to large rooftop projects, utility scale MW projects and a number of off-grid projects across North India. 9. What role do you think SolarMaxx can play in emerging trend of EV in India? As a starter, SolarMaxx solar panels were amongst the very first used to develop a prototype solar car by one of the leading private universities in India. Electric vehicles is the future of transportation. Whether it is India or anywhere else in the world, EVs will tremendously help in not only controlling but also reducing carbon emissions. We already have experience of integration of Li-Ion batteries with solar. One of the most important challenges in the EV segment is to have reliable power at charging stations, some of which may as well be located at remote areas especially on highways. Solar is possibly the best option to power these stations. Not only is Solar easy to install and maintain, it may in fact prove to be cheaper than to draw transmission infrastructure to these stations. With our experience with Li-Ion batteries, we believe we will be able to answer questions this new emerging sector may raise in the near future.